Offering you a complete choice of products which include customized magnets. 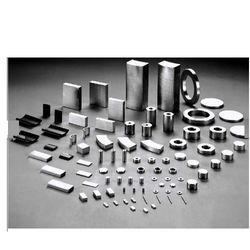 We are engaged in offering Customized Magnets for environmental protection. These couplings are based on magnetic technology and are manufactured using superior quality raw material. To ensure the protection of environment, leakage-proof torque transmission is widely demanded in process technology. Very high resistance to demagnetization. Looking for Customized Magnets ?